Description: Is the Fort Knox Personal Pistol Safe a good choice? This review covers its features, pros, and cons. With a name like Fort Knox, you’d expect the product to be secure. The feedback from many customers has been good, but is this really good enough to satisfy your requirements? I wrote this Fort Knox Personal Pistol Safe review so you’ll know what the safe is capable of if you decide to make a purchase. The Fort Knox Personal Safe is well built and should last a long time. Most customers use this to store guns, but it is just as effective as a safe repository for cash, jewelry, documents, and other valuables. It is easy to set up and access is quick. At the same time, the safe is secure enough unauthorized users won’t be able to access it. The box is designed to be as simple to use as possible. Just enter your desired combination and it’ll be locked, safe and sound. Programming the combination is easy. The buttons feel a bit loose but they don’t come off. They’re actually very responsive so you’ll have no trouble securing your items. The review of Fort Knox Personal Safe is to intimate about the benefits pros cons and other important things. One thing that needs to be pointed out is the safe does not come with a backup key. If you forget your combination you’ll need to contact Fort Knox to try and open it. You can also try a safe technician or a locksmith. Either way, it’s going to be a hassle to make sure you’ve got a copy of that combo code. The interior of the safe is 10.25 inches and 7.5 inches wide. With these dimensions, it should be easy to fit a Ruger GP100 revolver with a four-inch barrel. Any pistol up to ten inches long will fit in the safe nicely. The metal is approximately 8 inches thick and the rest of the body is built for heavy-duty use as well. The combination of the 3/16 inch plate door and the 10 gauge body makes the Fort Knox an ideal solution if you’re looking for a durable and reliable personal safe. 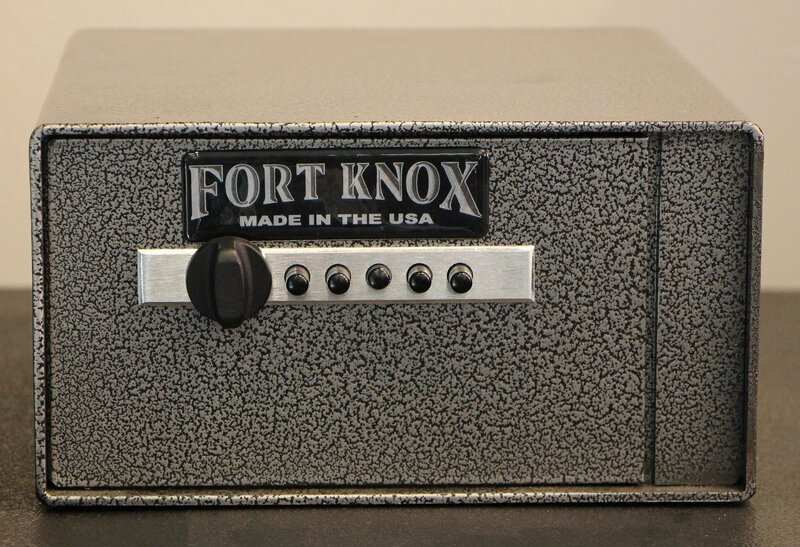 The Fort Knox is not strictly a gun safe, but don’t let that fool you since it has the features of a quality gun safe. The safe also has weight. It’s not too heavy but there is weight, an indication of the quality of the material used. The safe is clearly made for heavy duty use, and it is high quality and unlike other safes, the door opens quickly. Just enter the combination and the door instantly opens. That is all there is to use the safe so it’s ideal even for beginners. There are four holes at the bottom of the safe, something you’ll be able to use if you want to bolt the safe onto the floor. There is a nice, soft carpet inside that ensures your firearms won’t be damaged when you put it inside. This also holds true for any other item that you plan to put in the safe box. The quick access design is not just for advertisement, as it really does the job. The entire box is made in the US and is covered by a warranty so you’re assured of its quality. Fort Knox has gone out of its way to make certain the safe is well built, and it’s evident here. The spring assisted hinges to allow for smooth operation and the box opens without making a lot of noise. The gun safe is spacious and has room for your pistol and ammo, or plenty of papers, documents, cash, and other valuables. You can rest easy knowing your valuables are well secured yet within easy reach just in case. Another thing that you can expect from the box is its reliability. The box is solidly built and set up is easy and quick. No matter what you put in the Fort Knox box, you’re assured that it will be safe. This is undoubtedly a great safe. It’s useful in many cases. If you need something more lightweight or much handy for portability then the First Alert 5200DF maybe a suitable one for you. Except this, Fort Knox won’t disappoint you. So how was the Fort Knox Personal Pistol Safe review? There are a lot of gun safes today but few are as reliable as Fort Knox. The solid construction, the accessibility, and versatility make the Fort Knox a dependable safe, one that you’ll be able to use for a lifetime. Solid and Secured is a participant in the Amazon Services LLC Associates Program, an affiliate advertising program designed to provide a means for sites to earn advertising fees by advertising and linking to Amazon.com. *Amazon and the Amazon logo are trademarks of Amazon.com, Inc. or its affiliates.